Do different color flowers have the same pigments? Not always. We have 3 types of dark pink flowers at our house so we decided to experiment to see if all of them were made of the same pigments. The kids chose petals from the three different types of flowers to test–roses, gerber daisies, and pink flowers from our front shrubs. While they were doing that I set up the rest of the experiment that I found on Scientific American. This science experiment is more involved than the ones we usually do and definitely requires adult participation. 1. 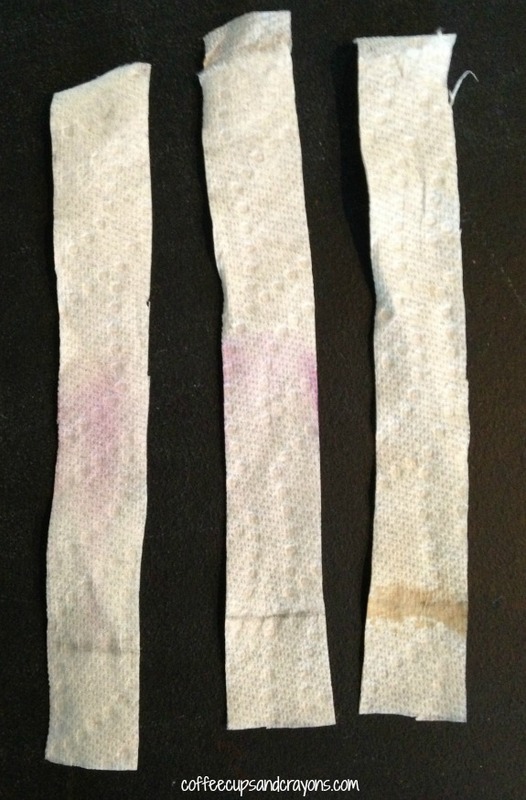 Draw a line across the paper towel strip 1 inch up from the bottom. 2. Pour some of the rubbing alcohol/water mixture into the jar–until it’s about 1 inch high. 3. Place a petal on the pencil line on the paper towel. 4. 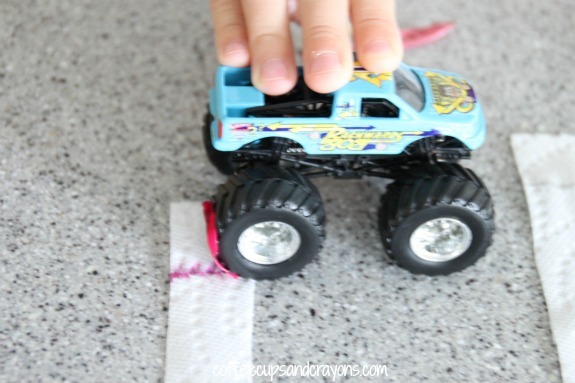 Have your child drive the car over the petal to transfer the pigment onto the paper towel. 6. Leave it in there for 20 minutes and let the towel absorb some of the liquid. 7. 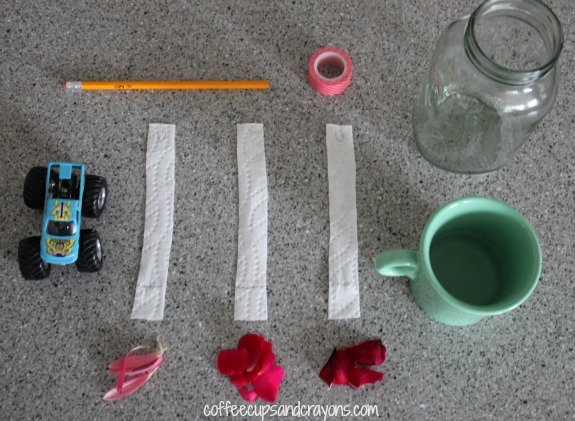 Tape to the side of a counter to let dry and repeat the process with the other flower petals. When the paper towels dry you can compare the color pattern to see if the flowers you tested are the same pigment. We tested three flowers and found that two of them were very similar and the third was definitely not. The results weren’t as vibrant as we had imagined they would be (and even harder to see in the photo!) and we discovered that pink isn’t the recommended color to test. If you are going to do this you may want to try red or purple or orange. The kids enjoyed the flower pigment experiment–even if my 3 year old didn’t quite understand the results! 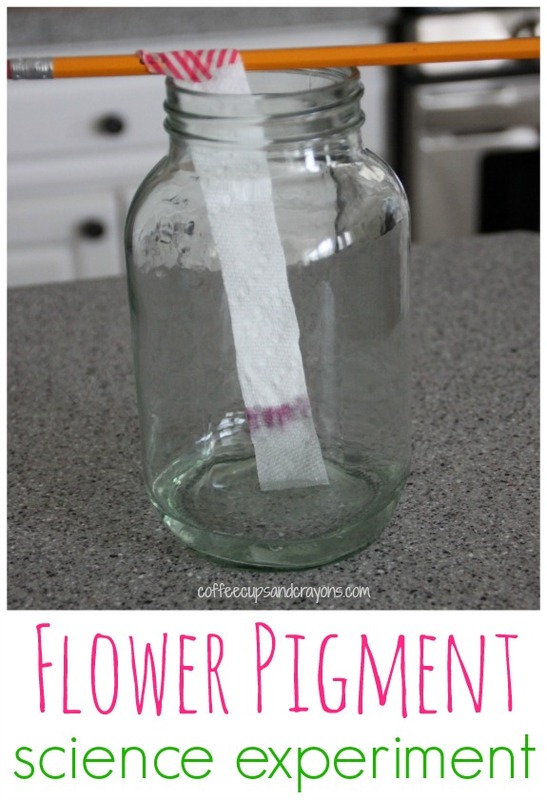 My 5 and 7 year olds want to try it again with red flowers and chromatography paper. It will be interesting to see how the results differ. We loved participating in science week! 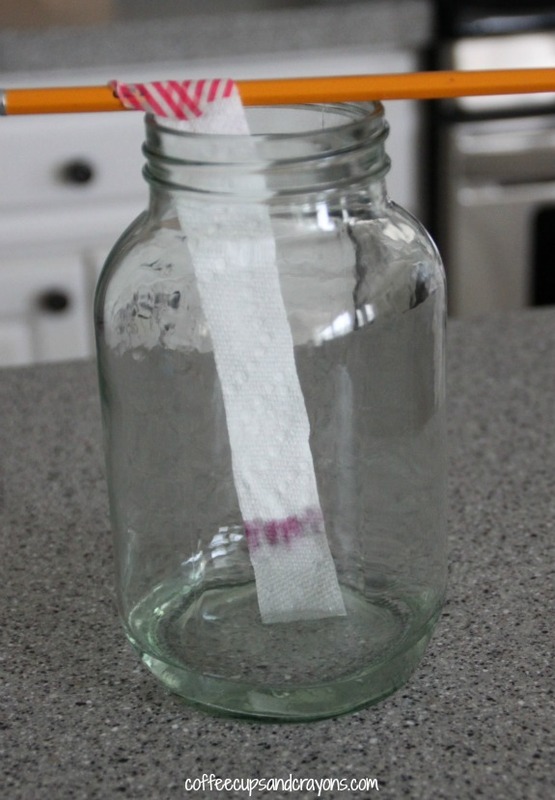 Make sure to check out our Cloud in a Bottle activity from Monday and out Does It Dissolve? experiment from Wednesday to catch up on all of the fun! Rolling over the pigment with a little vehicle is a great idea.its interesting to see how very different the root colors are. It worked perfectly and was much more fun than a coin! This is definitely one to do again–it’s so interesting to explore the pigments. I saw online that cornflowers don’t actually have blue pigments so the would be especially interesting. I LOVE this! What an awesome experiment. You should definitely try it Allison! Your kids would love it! Awesome! I love that you used a truck to transfer the pigment. My big kids thought observing was cool enough, but my 3 year old likes things a little more hands on!